Imagine for a moment that you are a bird. You have been flying all night, migrating, and now the sun is starting to come up and you can see what is beneath you. To your chagrin, all you see is buildings and streets. Then, to your relief, you notice the patch of green that is in the image above, which was taken from the top of the Empire State Building. You land, right? Of course you do. The other option is to continue flying past daybreak, which is dangerous both because you are low on energy and because hawks and falcons might come after you. Once you’ve landed though, you are in a bizarre situation. That patch of green isn’t very big and there are lots of people all around you. Hordes of House Sparrows and Rock Pigeons are more than willing to push you around rather then let you have that choice morsel you just found. And the noise! An ambulance with sirens blaring heads up Sixth Avenue and there is the slam of a delivery truck’s doors shutting. The trees are of one species and nearly devoid of insect life, the only plants are ornamental or lawn, and the amount of cover at ground level is virtually nil. If you have energy reserves left or if you get lucky enough to find enough food you will migrate out the next night. If not? Well, Bryant Park is now your home and you better hope that you can find a way to get enough to eat so you can move on or you will likely die here. 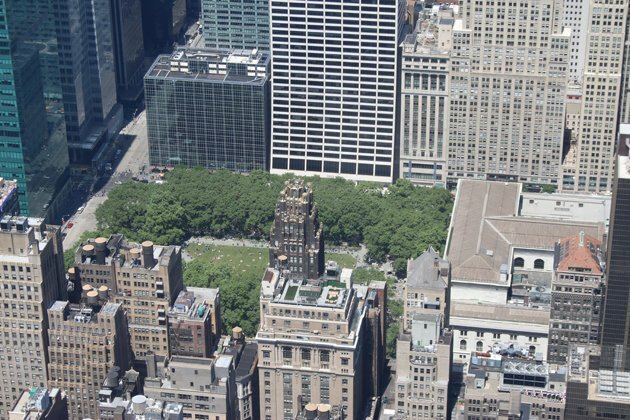 Almost every year there are a few birds that stick around at Bryant Park long after they are gone from the rest of the New York City area. Sometimes they are a very surprising species. Often at least one of the them is an Ovenbird. This year there are at least three. 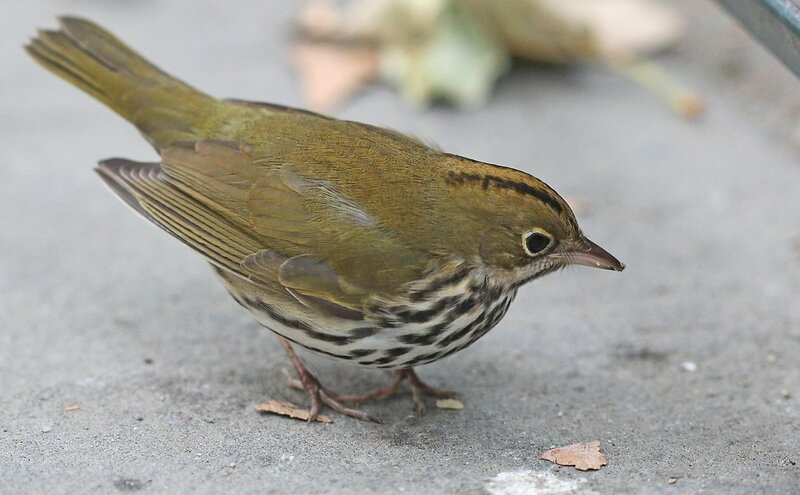 I spent a little over an hour at Bryant Park this morning, mostly photographing the Ovenbirds but occasionally turning my camera towards other species. It was fun because the birds were close, I had good company (Gabriel Willow and another birder whose name I have forgotten – sorry! ), and I had taken out my 100mm macro lens for the first time in a long time. And, for the record, when I say the birds were close I mean they were really close. There are a couple of out-of-focus pictures of birds I took while lying down where the background of the picture was my own foot. How cooperative were the Ovenbirds? Well, the picture below is uncropped. And, remember, I was shooting with a 100mm lens! You can click this image for a bigger version. But, really, do you need to see an Ovenbird closer than this? I’m pretty sure it actually bumped into the lens. It was a fun time even though, as usual, the species count was relatively low. Still, the experience of seeing birds so close is hard to match. 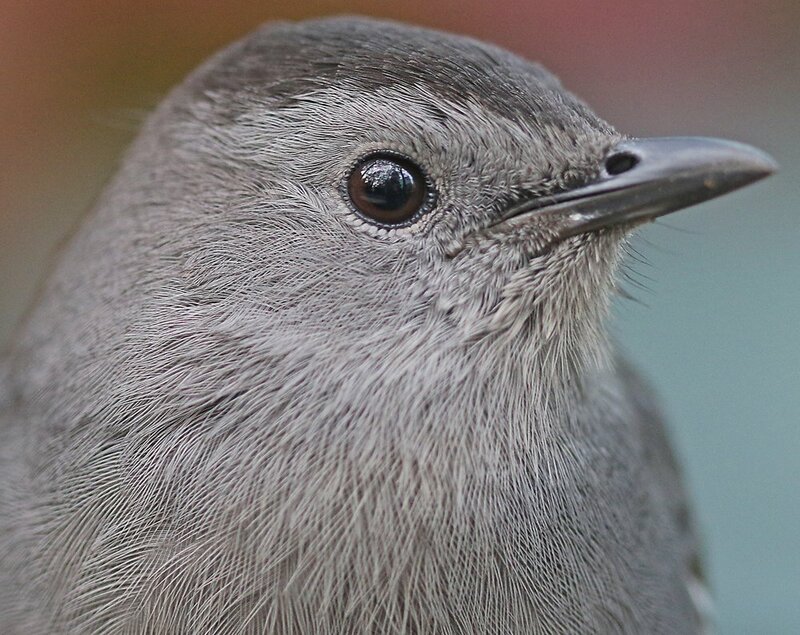 How nice is a very close Gray Catbird? Pretty nice! 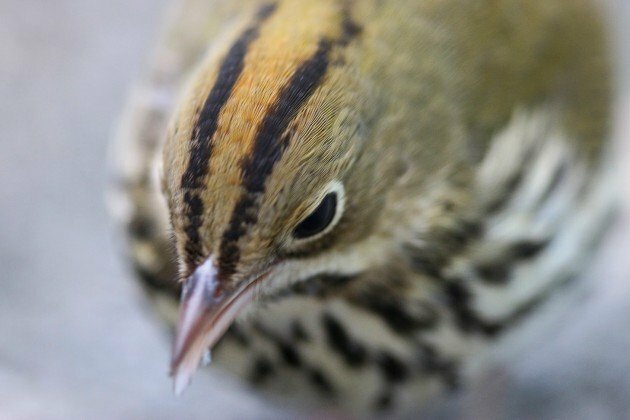 How often do you get to look directly down upon an Ovenbird? When birds are very close you can really appreciate the details of their plumage. I sure appreciated this Swamp Sparrow. Not everyone notices the amazing birds around them. Here’s hoping the Ovenbirds (and Hermit Thrushes, Gray Catbirds, Swamp Sparrows, and everything else) find their way further south before winter comes. He he.. no worries! I forgot yours as well, but I had the advantage of Gabriel being next to me to ask shortly after you left 🙂 See you birding around! That’s amazing to be so close! It really is. As a friend of mine said on Facebook, it’s not even birding. It’s something completely different. I think I see Corey in the catbird’s eye. And that’s even cooler than being in the catbird seat! Very cool. 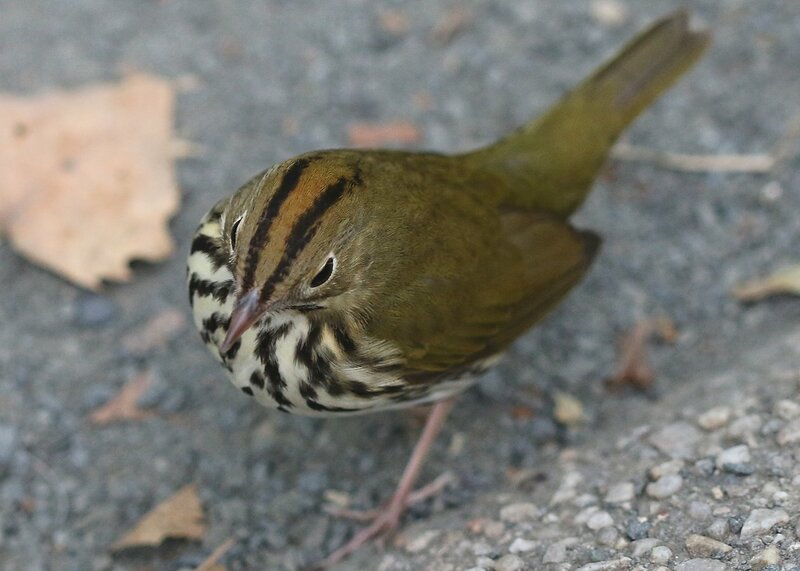 An Ovenbird bumping into the camera lens! I like the picture of the clueless man with the Ovenbird at his feet… some people just have no idea what’s going on around them. Thanks for sharing such a treat! 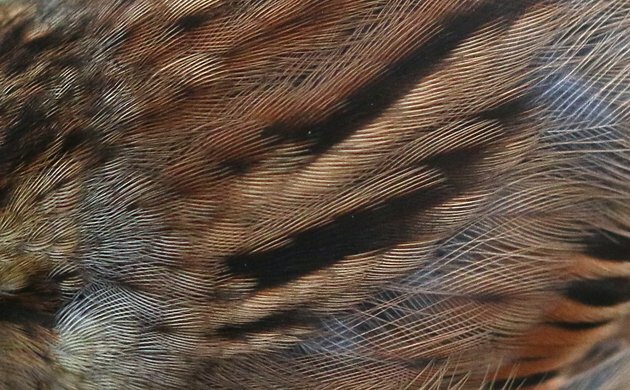 Those feather close-ups are so amazingly intricate. 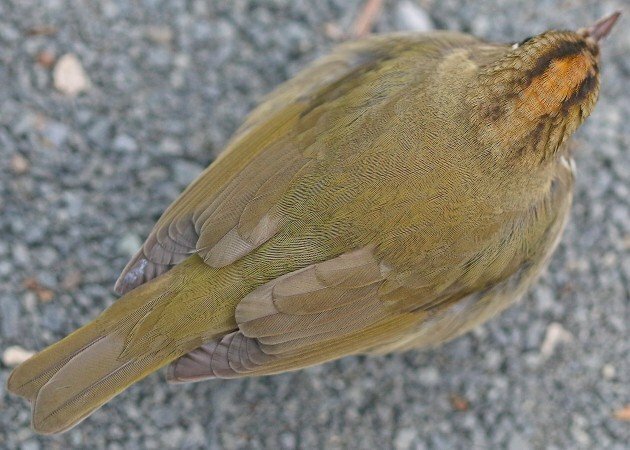 I foresee a diabolical bird ID quiz in the future! Wow, what great pictures! I have been wanting to begin watching birds but really don’t know where to start. I also live in Forest Hills, and would really appreciate any quick tips you can offer. Thanks for sharing this wonderful experience! Sandy, Forest Park in winter is a great place to learn the year-round forest birds before all of the spring migrants come back. There is a feeding station at the waterhole which is located near the southeastern edge of the park a bit west of Metropolitan. Folks usually start the feeders going in December.